The Misericordia University Office of Mission Integration in collaboration with the Office of Student Life and the project team from the Staff Leadership Development Program, launched McAuley Market, a food pantry open to students, staff and faculty on the campus in Dallas, Pa.
Channeling the tenets of Mercy, Service, Justice and Hospitality of the Sisters of Mercy who founded the campus in 1924, and their foundress Catherine McAuley, the pantry was named McAuley Market and is located on the lower level of Walsh Hall. During the ceremonial opening, Christine Somers, director of Campus Ministry, cited a need to provide support for those in the Misericordia community who are food insecure. She recognized senior Kristin Kuntzman, an occupational therapy major from Northampton, who initiated discussion on the idea for a food pantry on campus, and conducted a needs assessment survey. Current members of the Staff Leadership Development Program aided the project by helping secure and prepare space and shelving for the market, and conducted an initial drive to gather items for distribution. The team includes Leslie Risko, staff accountant; Lynn Blazaskie, clinical coordinator and instructor, medical imaging; Kristen Karnish, P.T., D. Ed., assistant professor, physical therapy; Andrew Loughnane, head coach, men's soccer; Mary O'Leary, Americorp Vista volunteer; Jeanne VanDuzer, campaign coordinator, University Advancement; and Kathy Zawatski, administrative assistant, Student Success Center. The pantry will be open for students on Tuesdays from 2-4:30 p.m., and on Fridays for faculty and staff, from 11:30 a.m.-1 p.m., or upon request to Campus Ministry or the Dean of Students Office. There will also be volunteers on hand on Friday's from 3-4 p.m. to accept donations. Items that are offered include toiletries and non-perishable food items, such as peanut butter, pasta, rice, cereal, soups, canned vegetables, granola bar, nuts and other healthy snacks. Christine Somers, director of Campus Ministry, cited the Sister of Mercy tenets of Mercy, Service, Justice and Hospitality as she welcomed members of the campus community to the ceremonial opening of McAuly Market, a food pantry for students, staff and faculty on the campus of Misericordia University. Senior occupational therapy major Kristin Kuntzman of Northampton initiated discussion on the need for a food pantry on the Misericordia University campus. Her efforts led to the development of McAuley Market. 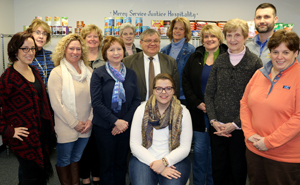 President Thomas J. Botzman, members of the Office of Mission Integration and project team of the Staff Leadership Development Program were among those participating for the opening of McAuley Market, a food pantry for the campus community. Shown, front row, is Kristin Kuntzman, senior occupational therapy major, Northampton, Pa.; second row, from left, Lindsay Riddell, community outreach coordinator, Campus Ministry; Lynn Blazaskie, clinical coordinator, medical imaging; Sister Cynthia March, R.S.M. ; Thomas J. Botzman, president; Amy Lahart, dean of students; Sister Jean Messaros, RSM, vice president for Mission Integration; Christine Somers, director, Campus Ministry; third row, Jeanne VanDuzer, campaign coordinator, University Advancement; Sue Helwig, vice president, University Advancement; Marianne Puhalla, staff writer, Public Relations; Kathy Zawatski, administrative assistant, Student Success Center; and Andrew Loughnane, head coach, men's soccer. Sister Jean Messaraos, RSM, vice president for Mission Integration at Misericordia University, gave the blessing at the opening of McAuley Market, a food pantry for students, staff and faculty on the campus in Dallas, Pa.